Omar García se reunió el 21 Enero 2016 con el líder de la oposición Jeremy Corbyn MP En el Parlamento del Reino Unido para hablar sobre las desapariciones forzadas en México y de la necesidad de traer al grupo de expertos de la Comisión Interamericana GIEI a una reunión con los parlamentos de distintos países europeos y asi contrarrestar los ataques mediáticos que el gobierno y el ejército mexicano han elaborado sistemáticamente en los últimos meses al ser presionados por el GIEI para que el ejército sea llamado a cuentas. 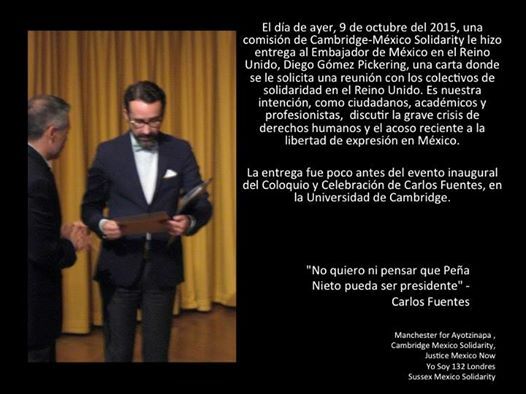 Durante un coloquio dedicado a Carlos Fuentes en Cambridge, Cambridge-Mexico Solidarity​ hizo entrega de una carta al embajador de México en el Reino Unido donde se solicita una reunión para discutir la grave crisis de derechos humanos y el acoso a la libertad de expresión en México. Many of the issues raised by my predecessor four years ago remain of concern, and many of the people I have spoken to have painted a very bleak – and consistent – picture of a society that is wracked by high levels of insecurity, disappearances and killings, continuing harassment of human rights defenders and journalists, violence against women, and terrible abuses of migrants and refugees transiting the country on their way to the United States. Official statistics show that 98 percent of all crimes in Mexico remain unsolved, with the great majority of them never even properly investigated. It is therefore not surprising the citizens of Mexico feel insecure – notwithstanding the drop in the homicide and kidnapping rates, which we all welcome. I do not want to simply repeat the statement made last Friday by the Inter-American Commission on Human Rights (IACHR) at the end of their visit to Mexico. I do however fully endorse the IACHR’s findings, which very much coincide with the views of my office and of the various other UN international human rights experts and bodies which have recently visited or reported on the situation in Mexico. And, indeed, the IACHR’s recommendations were also backed by the President of the National Commission for Human Rights, as well as by many civil society organizations, illustrating that there is a very broad consensus nationally, regionally and internationally on the gravity of the human rights situation in Mexico today. For a country that is not engaged in a conflict, the estimated figures are simply staggering: 151,233 people killed between December 2006 and August 2015, including thousands of transiting migrants. At least 26,000 people missing, many believed to be as a result of enforced disappearances, since 2007. Thousands of women and girls are sexually assaulted, or become victims of the crime of femicide. And hardly anyone is convicted for the above crimes. Part of the violence can be laid at the door of the country’s powerful and ruthless organized crime groups, which have been making life a misery for people living in several of Mexico’s 32 States. I condemn their actions unreservedly. But many enforced disappearances, acts of torture and extra-judicial killings are alleged to have been carried out by federal, state and municipal authorities, including the police and some segments of the army, either acting in their own interests or in collusion with organized criminal groups. The devastatingly corrosive impact of organized crime and the huge amounts of money these gangs command is co-opting or corrupting key institutions, and in some areas reducing Mexico’s impressive array of laws to mere words on paper. The combination of fear, greed and chronic impunity is potent, and millions of people are suffering from this poisonous cocktail which once brewed is hard to eliminate. A succession of specific recent incidents have drawn considerable international attention and concern. First, on 30 June 2014, the military authorities announced that soldiers, while fighting off an assault on a warehouse in the municipality of Tlatlaya in Mexico State, had killed 22 of the attackers, including a 15-year-old girl. It took several months, one brave witness and some courageous journalism, before an altogether different story emerged suggesting that the majority of the 22 people had actually surrendered and then been summarily executed, and three female survivors had been subjected to arbitrary detention and torture. Since then, more disturbing features have emerged including the apparent alteration of the crime scene and fabrication of charges against the survivors, as well as the nature of the operational orders given to the officer in charge of the operation. Shortly before this serious incident, the Military Code had been amended, placing the military under civilian jurisdiction in the case of crimes committed against civilians. The Tlatlaya case is one of the first to be examined under this revised system, and its progress will therefore be closely watched. Public confidence in federal and local institutions was further seriously undermined by the enforced disappearance in Iguala, in Guerrero State, of 43 students from the Ayotzinapa teacher-training college, and the killing of six others. Reports strongly suggest that local police engaged in repeated ferocious attacks and ambushes against the unarmed students, as well as against a local soccer team. The recent report by the Interdisciplinary Group of Independent Experts (IGIE), which was appointed by the Inter-American Commission on Human Rights and invited by the Mexican Government to follow up on the investigation of the Iguala case, dismissed the original official investigation’s assertion that the students’ bodies had been burned in a municipal dump. It also revealed that federal security forces were fully aware of what was happening, while it was happening, but did not intervene. It stated that the extent and complexity of the operations of various different police forces involved in the ambushing, arresting, shooting and enforced disappearance of the students meant there must have been centralized coordination. The Iguala case received huge attention, not just in Mexico itself but all across the world, and became a test case of the authorities’ willingness and ability to tackle violent crime and corruption. If the true fate of the students is finally revealed as a result of a thorough and determined investigation, and the full range of perpetrators are identified, prosecuted and convicted, with reparations granted to the victims, this terrible case could have a salutary effect on many similar situations across the country. It is important that the Government acts decisively on the IGIE’s recommendations including its insistence that the authorities reverse their decision not to allow experts to interview members of the 27th Battalion who were allegedly present on the scene when some of the attacks took place. Both the IGIE and the Argentine Forensic Anthropology Team shed light on the shortcomings and irregularities relating to forensic services in Mexico. An adequately resourced national autonomous forensic institution needs to be created as a matter of urgency. The reason why I have placed so much attention on the Iguala case, when so many other equally disturbing crimes have been committed in Mexico in recent years, is that — coupled with the subsequent discovery of a number of mass graves containing bodies that turned out not to belong to the disappeared students but to other unknown victims of unknown killers — the Iguala case is a microcosm of the chronic problems underlying the relentless wave of human rights violations taking place across Mexico. In particular, it highlights the prevalence of impunity and the disregard for victims that affect the entire country. Other recent high-profile cases which have yet to be properly resolved include the killings of nine people in Apatzingan in January 2015, and 43 people, including one police officer, in Tanhuato in May. The Iguala case also highlighted the weaknesses of the police, including their frequent direct involvement in committing crimes themselves. In Iguala, according to compelling evidence uncovered by the IGIE investigation, municipal, state and federal police – along with other State officials and the army — were all involved, either in the crimes themselves, or in failing to protect the victims, or in taking part in the ensuing cover-up. As one of the people I met in the past few days put it: “This is a country where, if you are victim of a crime, the last people you call are the police.” If the police do not function properly, then the entire justice system risks becoming dysfunctional. The new criminal justice system will have to overcome the problems confronting policing and forensics, as well as the weakness of the investigation system. As I said earlier, there is a very strong convergence of views about the extent and nature of the human rights problems in Mexico among UN bodies, the IACHR, the National Commission for Human Rights, civil society, academics, foreign diplomats – and above all, survivors and relatives of the tens of thousands of victims. Mexico has time and again been very generous in its invitations, not just to successive High Commissioners like myself, but also to other UN human rights entities, such as the various independent UN experts. So it was a surprise to us all when the UN Special Rapporteur on Torture, Juan Mendez, on publishing his recent report on Mexico, was subjected to virulent personal attacks by some politicians, despite the fact that the prevalence of torture – again usually at the hands of the police and investigators during the initial period after arrest – is well-established. Unfortunately this intolerance of public criticism has also manifested itself in reactions to most other recent international human rights reports on Mexico. My message on this new and disturbing trend, which is so at odds with Mexico’s constructive role at the Human Rights Council in Geneva, is as follows: instead of shooting the messenger, let us focus on the message. We’re all on your side. We all want to assist Mexico. Ignoring what is happening to this great country is not an option for us, and it should not be an option for the country’s elected politicians and State officials whose responsibility it is to protect the country’s citizens, as well as the migrants and refugees on its territory. Pointing out structural problems, as well as intervening on specific cases, is an important part of the assistance we offer to many countries. Nothing I have raised today will be particularly surprising to most Mexicans, and especially not to the poorest and most marginalized. I met with dozens of NGOs and other members of civil society, from many different parts of the country, and was particularly struck by their courage (many have been repeatedly threatened or even attacked), and their determination and commitment to keep working for a better Mexico, despite the obstacles they face. I urge the authorities to offer much better protection both to human rights defenders and to journalists, who have suffered an appalling litany of murders, threats, beatings and other forms of intimidation in recent years. A number of NGOs raised the issue of companies involved in so-called “mega-projects” failing to consult with indigenous peoples whose land and resources they plan to exploit, and I call on the Government to ensure that these companies in future take more care to establish proper consultation processes and enable the indigenous people to participate actively in the process of development. Above all I want to thank all the victims, and relatives of victims, who agreed to meet me and relate the traumatic experiences they have gone through, some of them at the hands of employees of the State, some at the hands of criminal gangs. They included women and indigenous people and each person’s story was intensely personal – an important antidote to the numbing nature of the incomplete statistics of the murdered, the raped and the disappeared. I also listened to a group of relatives of people who have disappeared, ranging from the daughter of a man who was forcibly disappeared in 1974 to a woman whose son was forcibly disappeared in September 2014. I wish everyone could meet and hear them. To have a loved one disappear, to not know if they are dead or alive; if they died, how much they suffered, how long it took; or, if they are still alive, where they are held and in what conditions; to have this awful mix of loss and impotence, this lack of certainty, gnawing away at you day after day, week after week, month after month, is a truly dreadful thing. It becomes doubly cruel when the authorities do not even bother – or dare – to investigate what happened to your son, daughter, sister, partner or best friend. I’ll repeat the numbing statistic once again: Mexico has at the very least 26,000 missing people, with new cases occurring every day. The amount of misery attached to that statistic is impossible to comprehend. The failure of the police, of the justice system to clarify the whereabouts of the victims and what happened to them, and above all of successive governments and the political system as a whole to stop these crimes is not just regrettable, it is deeply tragic. Tragic for the individuals involved, and tragic for the country as a whole. Over the past few days, I was heartened to hear senior Government officials describe a new determination to confront these challenges, and I informed them that my Office is ready to assist in any way we can. · Urgently strengthen the Attorney-General´s Offices across the country to ensure that human rights violations are properly investigated, leading to prompt results. · Urgently strengthen the capacity of the police to carry out their public security functions in line with human rights obligations, including developing a legal framework on the use of force. · Adopt a time frame for the withdrawal of the military from public security functions. · Implement the IGIE’s recommendations and consider similar follow-up mechanisms for other serious cases. The international community is full of good will towards Mexico, but ultimately it is only Mexicans – and especially Mexico’s political class — who can resolve these massive problems. The country has amazing human, as well as abundant material, resources. The problems have grown so large, it is a daunting task for any government to sort them out, but the government that succeeds – the one that radically reforms the police, makes justice work, slashes the crime rate and jails the criminals, puts the army back in the barracks, protects the marginalized, works hardest to reduce violence against women — is the one the nation needs and wants. The Government that taps fully into its citizens’ desire and ability to create a state that works, is the Government that will be remembered and praised by future generations. Such a Government would be able attract a massive influx of foreign direct investment, which would in turn stimulate greater and much wider prosperity for its population. I pray that this Government can bind itself to a new sense of urgency in solving the enormous human rights challenges it faces, so that every citizen will judge it to be that Government. One year after the forceful disappearance of the 43 students from Ayotzinapa, Mexico. Demonstration in London before the Mexican Embassy. September 26, 2015. On 26 September 2015 43 students from the rural school Raul Isidro Burgos of Ayotzinapa were forcefully disappeared following a violent attack from municipal and federal police forces. A few of their fellow students were killed and others injured. Since then, their families, NGOs, artists, human rights defenders and concerned citizens from all over the world have not given up on finding them. Over 100 people gathered exactly one year after the attacks outside the Mexican Embassy in London to say loud and clear that we still want answers and justice – for the 43 and for the thousands more Mexicans that are disappeared. CAMBRIDGE, REINO UNIDO. 25 DE SEPTIEMBRE DE 2015.- La comunidad mexicana, así como miembros de la comunidad académica internacional de la Universidad de Cambridge y habitantes en general de esta ciudad inglesa marcharon hoy para conmemorar el aniversario de la desaparición de los 43 estudiantes de Ayotzinapa, pero también para exigir verdad, justicia y castigo a los responsables. La marcha titulada “Memorial March for Mexico’s Disappeared” fue convocada por el grupo Cambridge – Mexico Solidarity y forma parte de las diversas actividades que durante esta semana y la próxima se realizan en universidades de todo Reino Unido con el fin de difundir el caso internacionalmente. “Pensamos que el gobierno está ocultando la verdad para proteger sus intereses y esconder su complicidad con el crimen organizado. Además, está promoviendo la falta de libertad de expresión (por ejemplo, los casos de asesinatos de periodistas en México)”, declaró la vocera de Cambridge-Mexico Solidarity, Natasha Tanna. El evento inició a las 17:30 horas, tiempo de Inglaterra frente a King’s College, uno de los colegios más emblemáticos de esta universidad. La marcha, dirigida por la artista mexicana Gabriela Garcia-Lopez, incorporó música popular mexicana, elementos teatrales y tintes alegóricos a las procesiones religiosas. Vestidos de luto, los participantes portaron velas, máscaras con los rostros de los estudiantes desaparecidos y mantas que informaban del caso y exigían justicia. Durante el recorrido de casi una hora por el centro de la ciudad se realizaron varias “paradas” o estaciones, a la manera de un viacrucis, para leer textos que informaban al público sobre lo sucedido el 26 de septiembre de 2014 en Iguala. Como una forma de hacer memoria sobre los momentos más importantes del caso se utilizaron máscaras, trajes, música y símbolos de la cultura mexicana. 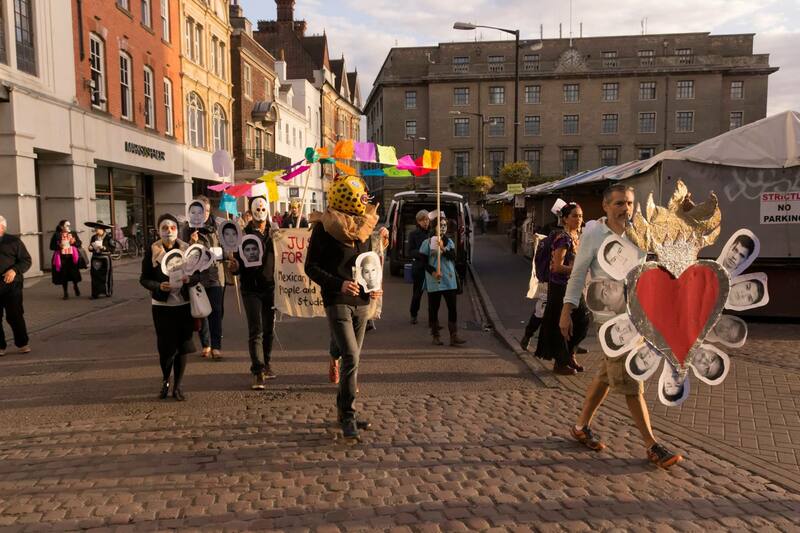 Además, personas maquilladas como catrinas, mariachis y vestimenta regional repartieron volantes entre turistas y habitantes de Cambridge que se detenían a apreciar la llamativa marcha. Los paseantes, sorprendidos debido a lo unusual de este tipo de marchas en Cambridge, se acercaban a observar y mostraron interés por saber más del tema. Para Natasha Tanna, estudiante británica realizando doctorado en la Universidad de Cambridge, es importante realizar una marcha aquí “porque aún no sabemos la verdad sobre qué pasó el día de su desaparición. El 2015 ha sido designado ‘el año de México en el Reino Unido’ y viceversa, así que aquí, en el Reino Unido, tenemos la posibilidad y la responsabilidad de crear conciencia de la situación y presionar al gobierno mexicano”. Las actividades de conmemoración continuarán mañana a las 18:00 horas con la proyección del documental “Ayotzinapa: crónica de un crimen de Estado”, del director Xavier Robles, en el Alison Richards Building de la Universidad de Cambridge. Integrada por estudiantes y residentes de esta ciudad, la organización Cambridge – Mexico Solidarity se creó el año pasado como parte de los movimientos que surgieron en universidades de todo el mundo para exigir justicia por la desaparición de los estudiantes de Ayotzinapa. “Queremos mostrar nuestra solidaridad desde Cambridge con las familias de los desaparecidos y queremos que el gobierno mexicano sepa que el mundo aun lo está vigilando”, expresó Tanna. A lo largo del año, dicha solidaridad se ha expresado a través de marchas, exposiciones del caso a representantes parlamentarios británicos, manifestaciones artísticas, apoyo a la EuroCaravana 43, así como actividades sociales para reunir recursos económicos que se han enviado a los padres de los estudiantes. Con motivo de la pasada visita de Peña Nieto a Reino Unido, Cambridge – Mexico Solidarity se unió a otros grupos que se manifestaron fuera del Parlamento. Los colectivos escribieron cartas a políticos y al primer ministro de este país referentes al abuso sistemático en materia de derechos humanos en México, con lo cual se logró que sus demandas fueran escuchadas en el Parlamento Británico.